We just created our latest update newsletter, and you can check it out by clicking the picture below. 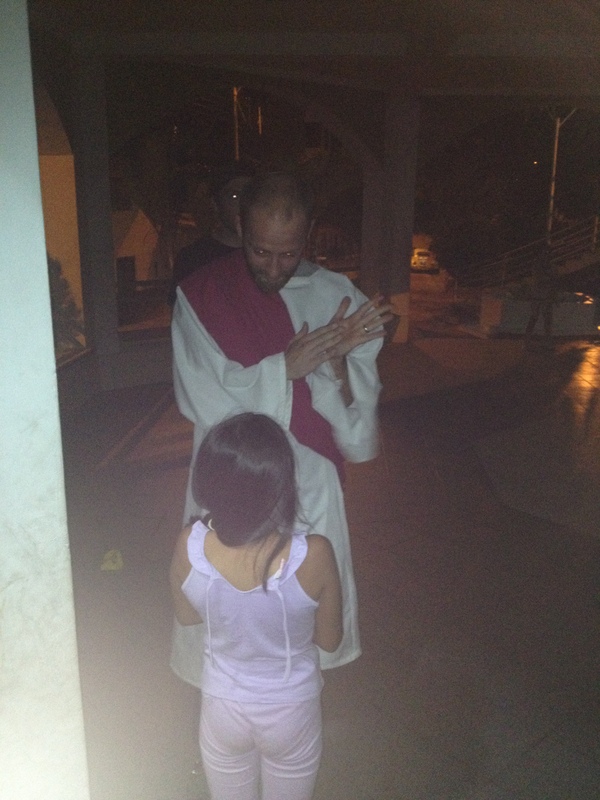 Thank you for being part of the Lord’s work here in Peru, and thank you for praying! P.S. Check out our new fundraiser store at the tab above: 100% Peruvian – Fundraiser Store! It has been a few weeks since I last posted, and since then Danielle and I were able to travel to the south of Chile where we attended the Calvary Chapel Family camp and made stops in Talcahuano, Concepcion, Valdivia, and Lanco. We were so blessed by the places we saw, the people we met, the amazing food we ate, the fellowship we had with our brothers and sisters in Christ, and the teaching of the Word of God at the Calvary Chapel Family Camp. While we have had our very good days, we have also had days that were a bit tougher as we adjust to a new language, new culture, and different schedules. Through good and bad, Danielle and I are anchored by the fact that we know God called us to South America, and opened the doors for us to be here. One example of having to remain anchored to the Lord was when we rented a car for six people to make the trip that would take about 20 hours or so overall to drive. We were told we were receiving a 7-person minivan with space for luggage, and we thought that would be a comfortable size and it came at a good price. Well, when we received the car it was more like 5 person station wagon made into a 7-seater with less leg room (for those in back) and trunk space than a Geo Metro. None of us were overly excited about spending 6-8 hours at a time in that car, but the Lord reminded me of a favorite verse of mine, “But none of these things move me; nor do I count my life dear to myself, so that I may finish my race with joy, and the ministry which I received from the Lord Jesus, to testify to the gospel of the grace of God.” (Acts 20:24) I shared it with Ricky, we had a little laugh after looking at the car again, and off we went. We have been beyond blessed to have seen the majority of Chile during our time here, and that we have made real friendships and relationships with our brothers and sisters in Christ from Iquique to Puerto Mont and everywhere in between. Here is a little map that shows some of the cities we traveled to. Talcahuano is the sister city of Concepcion, Lanco is near Valdivia, and Lican Ray is near Temuco. As our time in Chile is coming to end, I think one of the main reasons God brought us here for these 2 months was to meet and connect with many of our brothers and sisters in Christ. We’ve been able to get to know them, hear their stories, listen to their hearts, share the Word of God, and become very close with many. People ask us why we love Chile? While the beaches are nice, the sights are fun, and the south is awe-inspiring; our favorite part is the people we have met and got to know. We will keep our friends, and the work God wants to do here in Chile, in our prayers, and look forward to seeing them again. Before I finish, I want recount one very special stop we made in Lanco, Chile. Lanco is a small town of about 10,000, and was not one of our planned destinations before we left the US. In fact, I didn’t know we were going there until the day we arrived. As Danielle, myself, and the rest of the group arrived hungry and travel weary we were welcomed into the home and restaurant of our friend Cote and her family. Cote’s family has the best restaurant in Lanco, and they live in the upstairs portion of the same building. When we arrived they had a meal complete with roast, salad, bread, coffee, juice, and dessert waiting for us, and it was delicious. Then as we were getting ready to leave and find a place to stay in nearby Valdivia, they invited us to stay with them in their house upstairs. We thankfully accepted, traded our luggage for Cote, and went off to see Valdivia. 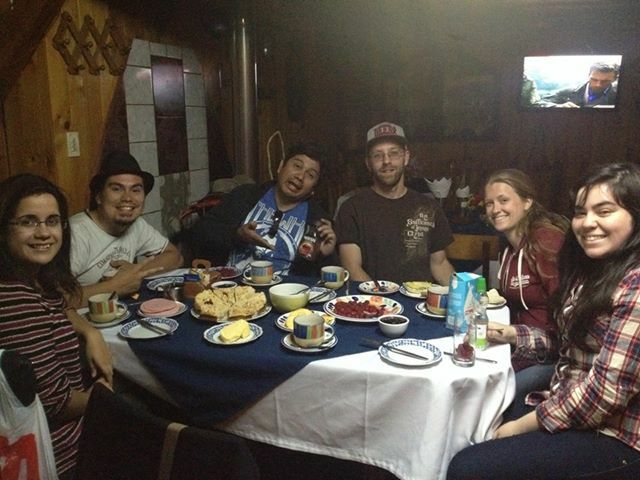 When we came back “Once” (Chile’s late night meal) was ready, which means more tea and coffee, bread, fresh picked raspberries, fresh milk, homemade cheese, a German-Chilean dessert called Crugen made with some of those fresh raspberries, and more. Then they made beds for all of us (except our friend Claudio, who had to make his own bed after he didn’t finish his Crugen lol), and sent us off in the morning with more amazing hospitality and wonderful food. And do you want to know what Cote’s mom said when I left? A very sincere, come back. Those are the type of special moments we can’t plan for, but thank God when he orchestrates them. Language: Please continue to pray that Danielle and I would be able to learn the language. We are studying daily, and learning a little more each day. The Work of God in Chile: Please pray that God would continue to work among his people in Chile, and all of South America equipping and maturing the Body of Christ, and drawing more and more people to Himself. Especially, pray for Ricky and Mayra here at the Bible College and CC Kaleo as we have been serving and staying with them. Health: Danielle and I have had a few little things nagging us, most notably Danielle’s ear. We have now been to 4 doctors (2 here, and 2 in the states) and we still don’t have a cure or really even know what the problem is. Love and Serve: Pastor Joey Buran from Worship Generation in Orange County was here in Chile working with Chilean National Surf team, and he was a big encouragement to us while he spent a day with us in Santiago. One of the big things he talked about was loving and serving the people in Chile until they just can’t take it anymore, and ask why we are different. Please pray that my wife and I would have the heart to love and serve. 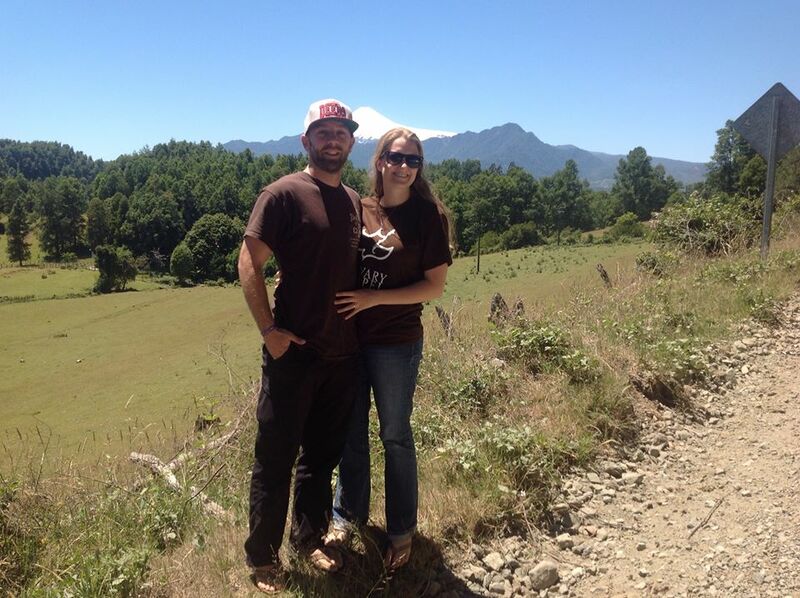 Danielle and I with Villarica Volcano in the background. This is near where we stayed for the CC Family Camp. We leave in less than a week! As many of you know Danielle and I will be serving the Lord and studying the Bible in South America for the next year! We are very excited for this next chapter of our lives, and to see what God has in store for us in South America. 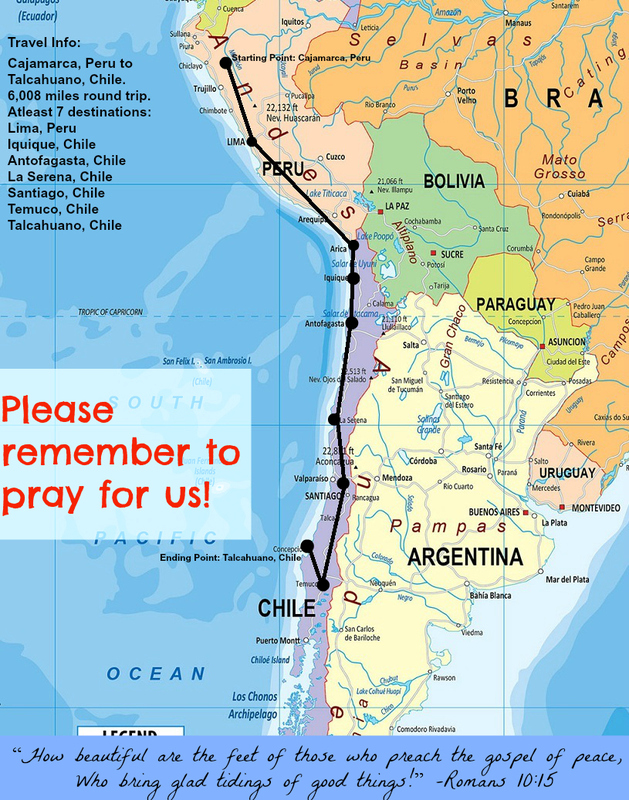 We wanted to share our plans and give you this prayer magnet so that our family and friends, brothers and sisters can be a part of our trip, and remember to pray for us. We are leaving for Lima, Peru on Tuesday, December 3rd and will arrive in Peru late the following night where we will meet Manolo and Holly Matos of CC Lima. He and his wife are housing us for the night, and from there we will bus to Iquique, Chile where we will meet Ricky and Mayra Plazas from CC Kaleo and CCBC Santiago-Chile. We will spend three nights in Iquique, Chile ministering, then fly to Antofagasta, Chile and spend two nights there, then fly to La Serena, Chile spend two nights there, then fly to Santiago where we will spend the majority of our time while in Chile. We also will be attending a family camp for the Calvary Chapels of Chile, and hopefully spend some time visiting the city of Talcahuano. Talcahuano was hit very hard by an 8.8 earthquake and ensuing Tsunami in 2010, and has been a place on our heart to visit for several years. We are so blessed to be able to serve with Ricky and Mayra during this time, and help them with whatever is needed. On January, 31st 2014 we will fly to Peru and attend Calvary Chapel Bible College Peru-Cajamarca as students for the spring semester. The new campus in Cajamarca is still under construction, and many of the comforts we are used to in America will not be part of our life in Cajamarca. We would ask that you keep us, Pastor John, everyone who is going to be there, and the work at the college in your prayers. There have been many difficulties as John as taken this leap of faith to construct a new Bible College campus with the hope of raising up many Pastors, leaders, and missionaries in South America. We are very excited to help hold up John’s hands in the work, grow in the Word of God, and be part of what God is doing there in Cajamarca and South America. Our hope is to stay in South America for at least a year and attend at least two semesters of Bible College while waiting on the Lord to see if He would have us stay in South America for a longer period of time or perhaps even permanently. We are very open with our long-term plans as God has only shown us these first steps, and trust that God will reveal His will for our lives as we serve Him and love the people around us. Also, God has been so faithful to provide for our trip above and beyond what we had planned for, so we are blessed and provided for! Praise the Lord! We just ask that you remember Danielle and I in your prayers, and if possible stay in contact with us from time to time. We are on facebook, but we also have set up this blog so that you can follow along with us, sign up to receive update emails, and get more information. Thank you again so much for your prayers, your love, and your fellowship! This is something I wrote on my other blog LoveDemonstrated.com sharing my heart on loving God, loving others, and reaching the lost. I hope you will be blessed by it. UPDATE: Here are our planned dates of arrival for each city we will be ministering in during our Chile Trip: Iquique: 12/7, Antofagasta: 12/10, La Serena: 12/12, Santiago: 12/14. We will be in Chile from 12/7-1/31. We also hope to visit the city of Talcahuano while we are there. Afterwards, we will travel to Cajamarca, Peru where we will attend CCBC Peru. Thank you for your prayers! This is our missionary journey through Chile and where we will attend Bible College in Peru. We hope to serve the Lord in any way He leads, and minister to, and love, each person along the way. We will be serving alongside Ricardo and Mayra Plazas who direct the Bible college in Santiago, as well as Pastor the local church there while we are in Chile. We are very excited to see what the Lord has in store!